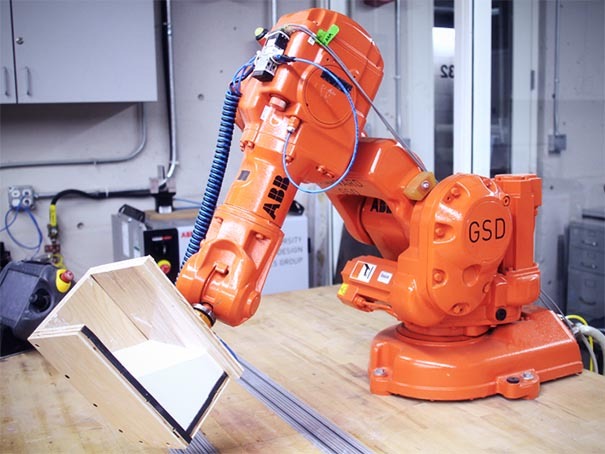 We are pleased to announce the final Rob|Arch 2012 workshop: Led by Martin Bechthold and Nathan King, Harvard GSD will host a robot workshop at TU Graz. The topic of their workshop is “Robotic Casting”. Like all other workshops, the Harvard GSD workshop will take place from 14th to 16th of December. Participants will also have the chance to register for the free ABB-sponsored RobotStudio pre-workshop on the 13th. The workshop explores novel approaches to serially customized casting processes enabled through the strategic deployment of three 6-axis robotic manipulators. Combining bottom up and top down design approaches, the workshop includes the design and fabrication of robotic molds geared towards the production of customizable structural components. The workshop production process takes full advantage of the robot's ability to precisely choreograph the mold position in space and time. The production will generate a controlled yet infinitely variable family of structural modules that combine into a larger physical prototype. Pike Loop from Storefront for Art&Architecture on Vimeo.